The Continuing Professional Development and Outreach Unit invites you to register for its upcoming Introductory Sign Language Course. The course takes place from May 27 to August 12 (Mondays: 5 to 7pm) at the School of Education. UWI Staff, students, groups of 2 or more: TT$1100 | Regular cost: $1200. The deadline for payment and registration is May 3. The Certificate in Sign Language Level 1 course will take novice signers and signers with some competence through skill development to a level of communicative proficiency where they know how, when and why to say what to whom. The organizing principle behind the course is meaningful and appropriate communication with crucial attention to visual spatial grammar and TTSL vocabulary. This course focuses on the communicative purposes of people’s everyday interactions with the grammar introduced as determined by the communicative functions. The target audience range from The UWI faculty, teachers (Primary and Secondary) wanting to develop their foundation skills in a sign language; Staff of the Student Support Services of the Ministry of Education, members of the public who serve as volunteer interpreters in various settings and would like to hone their skills and children wishing to learn a second language. 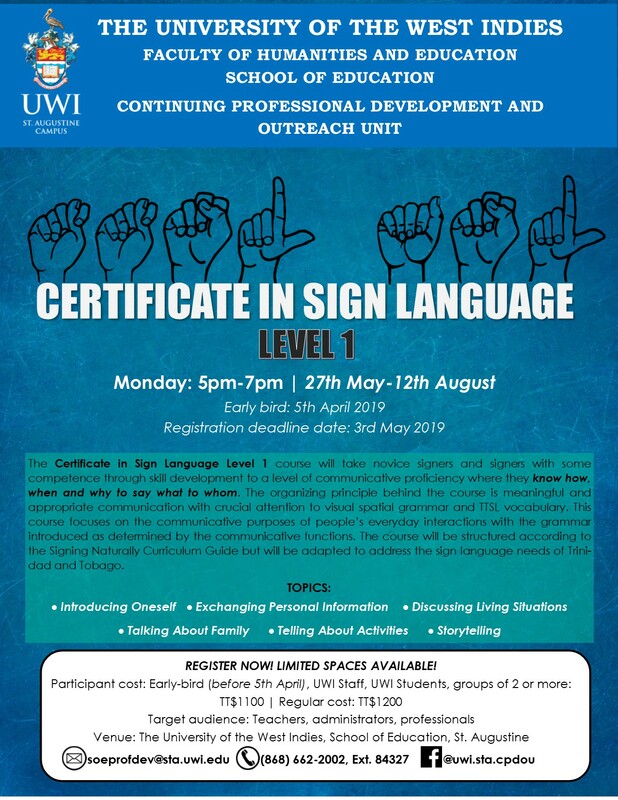 The course will be structured according to the Signing Naturally Curriculum Guide but will be adapted to address the sign language needs of Trinidad and Tobago.